My first Christmas post ... is this really possible? It's not yet December but I already have my Christmas on, and it makes me insanely happy. I happen to be someone that loves Christmas. Turns out this is the first Christmas that I have to myself in about 8-10 years. For more than the first half of the last decade, I made Christmas sweets to order back in Mumbai. So as you can imagine around mid November, things would kick into higher gear with the prep, graphic work, shopping and planning of the month ahead and come December I'd be buried to my ears in work. It was exhausting but I loved every second of it and I can't wait to do this all over again here in Sydney. Not this year though. After spending the last few years in Retail, which at this time of the year has you running off your feet, I have decided to take a little time off. Time to step back, re-prioritize and take some time off. We going to spend Christmas with the family in Bombay this year and I'm really excited. So you should see a little more of me on the blog at this time of the year. For my first Christmas treat, I'm going to share with you a little chocolate creation that will knock your socks off. If you aren't wearing any socks at the moment, I'll wait for you. Put them on and come back to check the rest of the post and prepare to have them knocked off. Almond Rocks are so simple to make and need just 2 ingredients. You can make as big or small a batch as you'd like to. But I must warn you, these are so addictive, do yourself a favor and make a bigger batch than you need. You can also adjust the chocolate to be as intensely dark or sweet as you want it. We personally love dark chocolate, so I use a 70% dark chocolate straight up. If you like a sweeter chocolate, you simple use milk chocolate. If you're in a Goldilocks kinda situation, use half semisweet / dark and half milk chocolate. So you see what I mean, you could have your chocolate just the way you like it. So that's about your first ingredient. Now onto your second, the almonds. I use just the regular natural almonds and I roast them myself. I find the flavor much better this way. But you could use store bought roasted almonds too. Those are the ingredients for you. Now let's put these together, shall we. 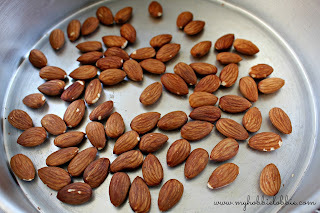 Place the almonds on a baking tray and roast in the oven for 5 minutes. Toss the almonds and place back in the oven for another 4-5 minutes. Check at the 3 minute mark this time. You may not need as long as 5 minutes, depending on the size of your almonds and your oven. You want the almonds to slightly change color and you will distinctly be able to smell the nuttiness. You need to watch the almonds as you don't want them to char or burn. While this is happening, roughly chop the chocolate into small pieces. Remember, the smaller the pieces, the faster it will melt, which is a good thing. If you haven't worked with chocolate before, please ensure that all surfaces, bowls/plates, knives that you use to work with the chocolate are comepletely dry. Water and chocolate don't get along. 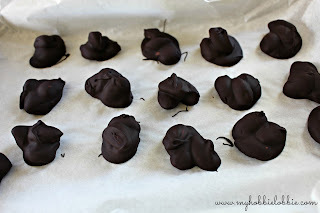 Any moisture will cause the chocolate to seize and that is NOT a good thing. Place the chopped up chocolate in a microwave suitable bowl and pop it in the microwave for 30 seconds. Stir and return to the microwave for another 15 seconds. Stir again. As you stir, you will see the chocolate starting to melt. 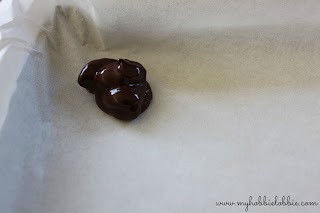 It took me a further 15 seconds (1 minute in all) to get my chocolate melted. Stir well and as you stir, the chocolate continues to melt and gets silky like this. 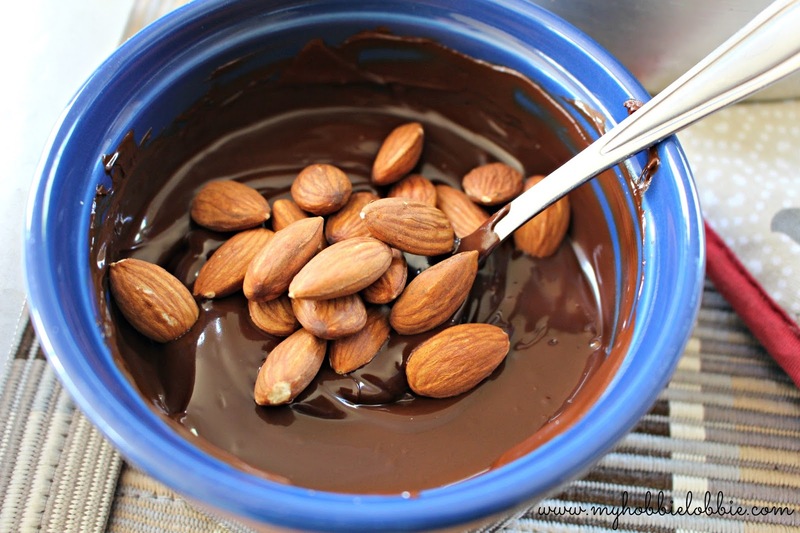 Tip the completely cool roasted almonds in the chocolate. At this stage, you may feel like there isn't enough chocolate, but trust me, there is. If you want to, you can add the almonds in two stages. Stir the almonds into the chocolate to make sure every nut is well coated in the chocolate. 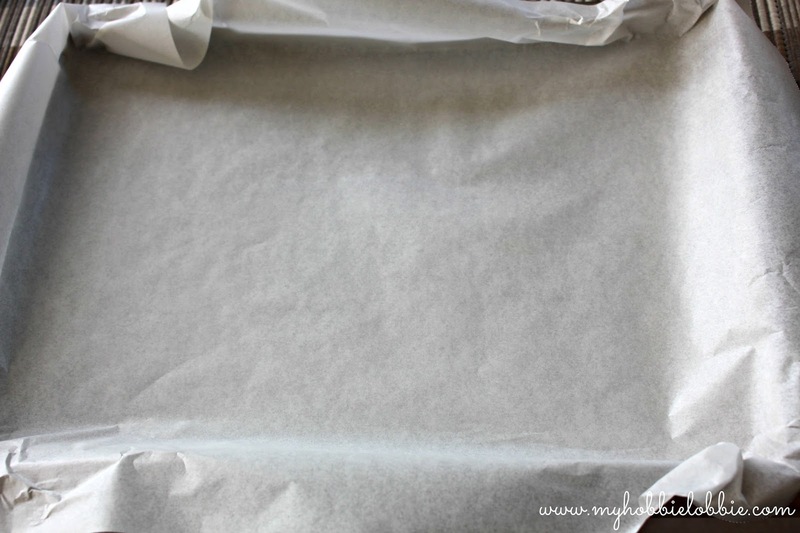 Line a plate or platter or tray with parchment paper. Repeat with the rest of the almonds and chocolate. I love the irregular shapes of candy you get. I think its what gives these almond rocks a lot of character. Pop the tray in the refrigerator for around 20 minutes to set. This is what it will look after it has set. Keep refrigerated till you are ready to serve or store in an airtight container in the fridge. If you want to wrap them in colored candy wrapping foil you can do so at this stage. You could also pop them in little festive bags and use them as edible gifts or host / hostess gifts this holiday season. I am going to leave them uncovered. 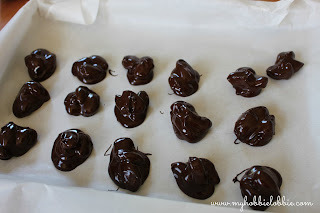 Note: If you are making a massive batch, melt your chocolate in batches that way it is easy to work with. However if you find the chocolate getting too thick to work it, microwave it for about 10 seconds and you should be good to go. 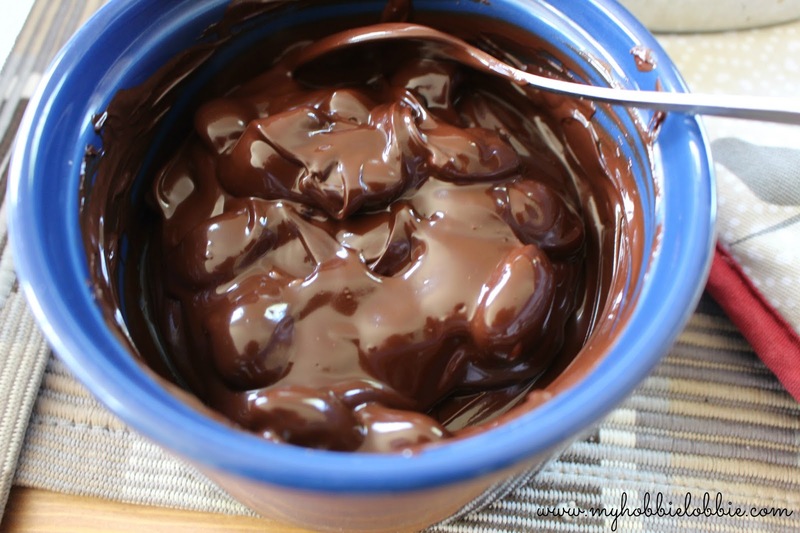 If you don't have a microwave, you could use the double boiler method to melt the chocolate. 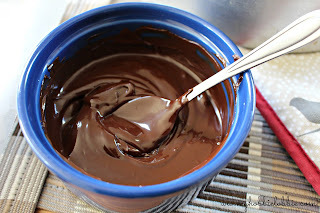 Simply place a bowl with the chocolate over a pot of simmering water, making sure the water doesn't touch the bottom of the bowl and no moisture or vapor gets to the chocolate while you are melting it. I love that combo. 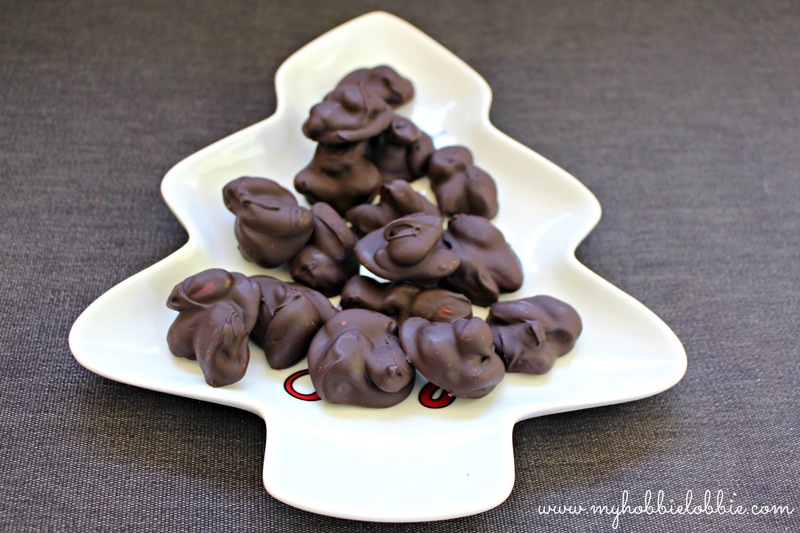 Thanks so much for stopping by and linking the recipe to my first link party. I was kinda nervous about it. Hope to see you in January when I will be launching the First Monday Favorite Recipe link party.